Also known as the Grand Sport. Seca for Sunday’s America’s Tire 250.
time this year enters a race leading the Driver and Team championships. stands second and 12 points out of the lead. which the team has competed in each of its previous 19 seasons. wins in 2013 and 2014.
victories at Laguna Seca with four each. Corvette Racing, Chevrolet and the Chevrolet Corvette. Motorsport Park and Road America. 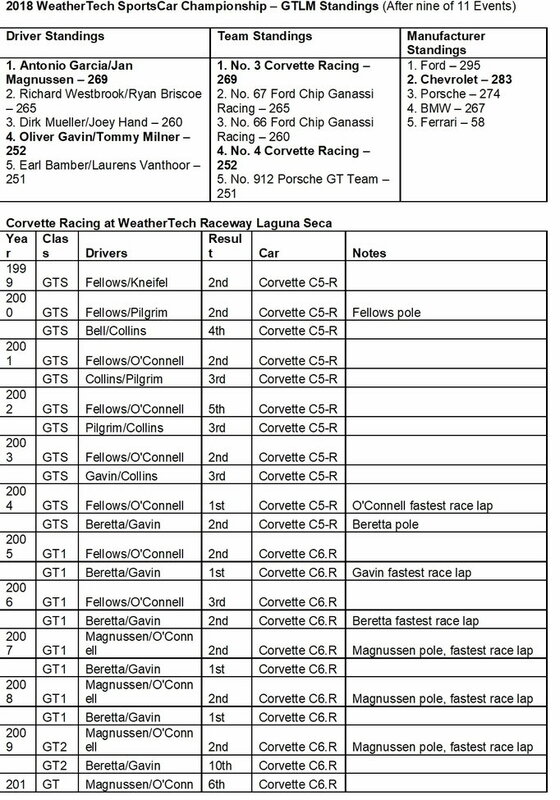 four of Gavin’s have come with Corvette Racing. sold worldwide and is the most successful engine in American motorsports. seven went on to win at Monterey. manufacturer and team in GTLM. Rivieres, Utah, VIR, Washington DC and Watkins Glen. trips along historic 17-Mile Drive on the Monterey Peninsula. spaceflight in history – covered “just” 248,655 miles.